Sold all my Chubby 2's years ago. Handle is too small for my preference after all. Still stunned over the fact, that I bought that many Chubby 2's in denial of a dislike for the handle size and shape. Yes it can. I seem to remember a time when I couldn't get used to the size of a Chubby 2 handle. Now you'd never know with a best, 3-band Super, 2-band Super, and 2 Manchurians Chubby 2's to choose from. Yes, I have owned a Polo 10, but unfortunately the loft on the Polo 10 2-band Silvertip was a bit too high for my preference, but it still was one of the best most comfortable Simpsons ever for me. 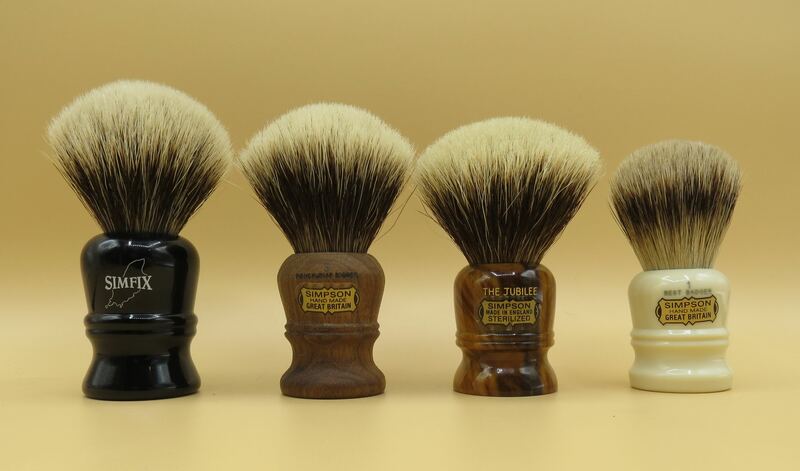 My ideal Simpson would be a Duke 4, if such a thing existed - Duke 3 handle is a bit too small for my liking and the knot a bit on the thin side, so Duke 4 with a 26-27 mm knot, medium loft and a nice fatter higher version of a Duke 3 handle would be perfect. The Chubby 3 handle was alsmot ideal, yet still too short. This is why I found my peace in Bernd's custom made Shavemacs, where I can have him make just about any shape handle for me in my preferred knot and the larger 4125 model 26mm/28mm 2-band Thäters with the octogonal handle shapes. (07-28-2018, 09:21 PM)CHSeifert Wrote: Sold all my Chubby 2's years ago. Handle is too small for my preference after all. Sounds like you'd enjoy a Tulip 4? At least for me it has an exceptional handle. Never thought of that, but the Grosvenor basically is a Duke 4. Grosvenor or Simfix whatever they are called, are you sure the knot will be the equivalent of a more dense thicker Duke 3 knot as in a true Duke 4 ? I still hope for a Duke 4 Silvertip 2-band in bulb shape. What I heard as well. Hoping for a 2 Band knot for it. According to the information gathered, there will be 100 units of CH2 sterling silver handle filled with Manchurian hair. Price has been stated in previous posts. Regarding the Duke 4, I have an original Grosvenor from 2012 release with old Simpson 2-band hair and an actual Simfix 404 in silvertip 2-band. Knots are smaller (between 21 and 22mm) than my Duke 3 (24mm) and not as densely filled. 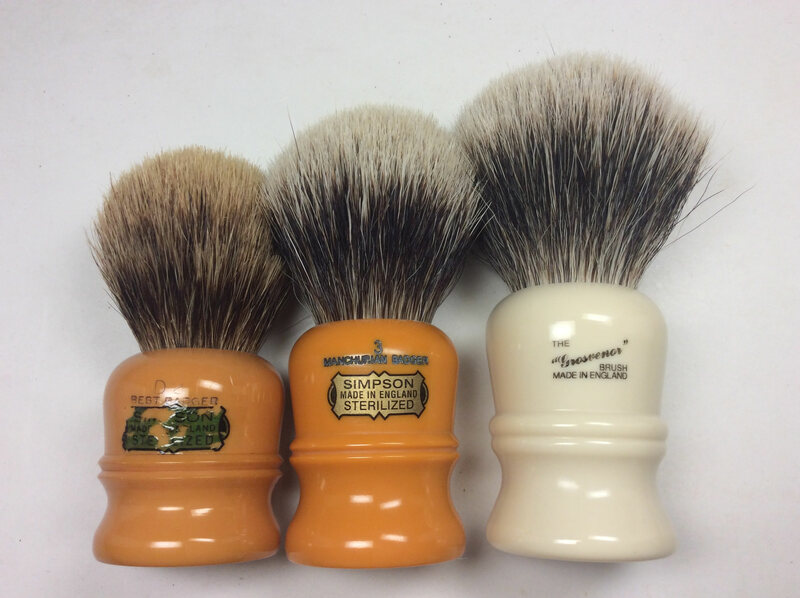 Both are however awesome brushes, the vintage one being extremely soft. (07-30-2018, 11:07 AM)YomD Wrote: According to the information gathered, there will be 100 units of CH2 sterling silver handle filled with Manchurian hair. Price has been stated in previous posts. What is the price? Is it 1919 pounds? I hope Simpsons for their centennial bring back the AS3M in Ivory with a Manchurian knot that has a distinct bulb shape! (07-30-2018, 10:30 AM)CHSeifert Wrote: Grosvenor or Simfix whatever they are called, are you sure the knot will be the equivalent of a more dense thicker Duke 3 knot as in a true Duke 4 ? I'm sure they would special order it to Duke density. The Simfix has Simpson hair at Vulfix density. It's those 3-band Super brushes that aren't filled enough on the Vulfix brand. The Vulfix Silvertips have plenty. The Simfix Grosvenor I have is of good density for me, but definitely not to Duke level density. I hope Mark uses a similar stamping system for the 100th year anniversary model. You’ve seen the finished brush Sir? The few pictures of the handle on Twitter or Instagram are gorgeous.